*Note – Home repair activities featured in the article below were made possible through a funding award from the TDHCA HOME Homeowner Rehabilitation Program to Jim Wells County. Five Jim Wells County (“JWC”) residents received new homes through a federal grant called the HOME Program. Funds go towards assisting low income homeowners with repairs to bring their homes into compliance with local codes and construction specifications. The grant also replaces homes with a new house when repair costs are greater than the allowable limits for repairs. JWC has participated in the HOME Program since 2001. According to Donna M. Johnson, GrantWorks associate vice president of housing programs, to date, in cooperation with the Rural Economic Assistance League (“REAL”), more than 100 homeowners have been assisted and 55 of those were in JWC. As per grant requirements, the residents already owned homes and paid their taxes, but their houses were falling apart around them and they didn’t have the money to keep them up. The applicant must have a clear and marketable title (may have a mortgage but no contract for deed), and the total income of everyone living in the home must be less than 80 percent of the Area Median Family Income. The program participants applied for the grant through the county’s consultant GrantWorks, and the Texas Department of Housing and Community Affairs (“TDHCA”)*. Applications were taken at the Rancho Alegre Community Center. The process involves a large quantity of paperwork and patience, but in the end is well worth the wait. 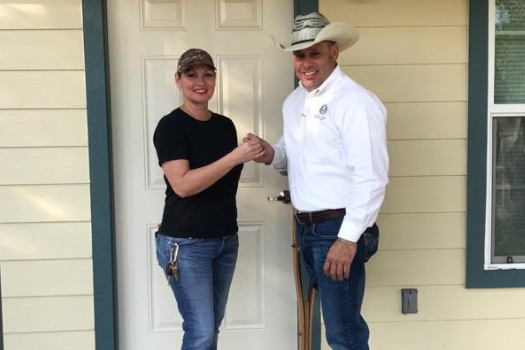 County Judge Pedro Treviño Jr. had the honor of handing the keys over to the homeowners. Also in attendance was grant consultant Jay Frances and Malouf Construction superintendent Rick Herrell. The homes are three bedroom, two bath and are accessible to people with disabilities. There are three-foot doorways, a low step shower and grab bars in the bathrooms. They are energy efficient and have all new appliances. Homeowners were provided paint and flooring samples to choose from, and had the opportunity to select their exterior colors. Assistance requires no repayment as long as the homeowner continues to own and occupy their home for up to 15 years. * The U.S. Department of Housing and Urban Development (“HUD”) provides HOME funds to TDHCA through an annual formula grant. The Department awards these funds to eligible applicants, such as Jim Wells County, which expends the funds at the local level to expand the supply of decent, affordable housing.